A few days ago we released pglogical, a fully open-source logical replication solution for PostgreSQL, that’ll hopefully get included into the PostgreSQL tree in a not-too-distant future. I’m not going to discuss about all the things enabled by logical replication – the pglogical release announcement presents a quite good overview, and Simon also briefly explained the advantages of logical replication in another post a few days ago. 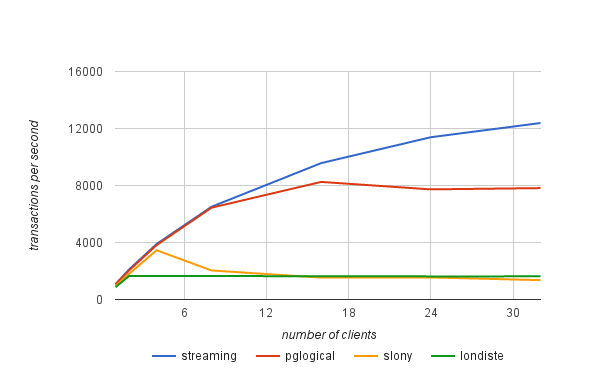 … preliminary internal testing demonstrating a 5x increase in transaction throughput (OLTP workloads using pgBench ) over other replication methods like slony and londiste3. So let’s see where the statement comes from. This post explains the details for the benchmarks we performed to find the maximum “sustainable” throughput (transactions per second) each of the solutions can handle without lagging. To do that I’ve ran a number of pgbench tests on a pair of i2.4xlarge AWS instances with varying number of clients, and measuring the throughput on the master and how long it took the standby to catch up (if it was lagging). The results were then used to compute an estimate of the maximum throughput on the standby node. So in that case the maximum sustainable throughput on the standby is 6.666 tps, i.e. only ~66% of the transaction rate measured on the master. and a simple replication was set up as described in the tutorials (both use the pgbench example used for the benchmark). The results presented next also include streaming replication (asynchronous mode) to give you a better idea of the overhead associated with logical replication. The transaction rates are not the “raw” numbers as measured by pgbench, but the “sustainable” rates computed using the formula presented at the beginning of this post. Can pglogical do the multi master to single slave replication.